This application form is for a general career at Denali Raft (positions listed below). If you are looking to become a river guide, see the specialized application form. If more than one checked, which position do you prefer? Please include: Employer name, address, and number. Also include employment start and end dates, and job description. Computer Skills - Which programs you are comfortable with? Clubs you have participated in, hobbies, musical skills etc. Qualifications - I am at least 21 years of age and have at least three years driving experience with no more than two minor driving violations and I will be able to pass a physical exam as mandated by the Federal Department of Transportation. I am willing to live in the Denali Park area, either in our employee camp or local housing. Due to our remote location all employees must be able to drive company vehicles and be acceptable to our insurance company. I am available to work approximately May 20 to Sept 10th for raft positions or May 10th to Sept 24 for Gift Shop. You’ll find us at Denali National Park! Our office is located at mile 238.6 on the George Parks Hwy, approximately 0.5 miles north of the park entrance. All rates are for 2019 rafting season. Prices are subject to change without notice. Trips are offered from May 20th to September 10th seasonally. Last minute arrivals are always welcome, but to guarantee space on the trip of your choice, reservations are highly recommended. Trips fill up quickly, so please make reservations early. Try it for fun! 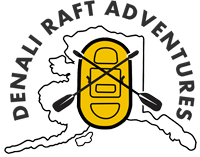 Experience rafting in Denali at its finest!